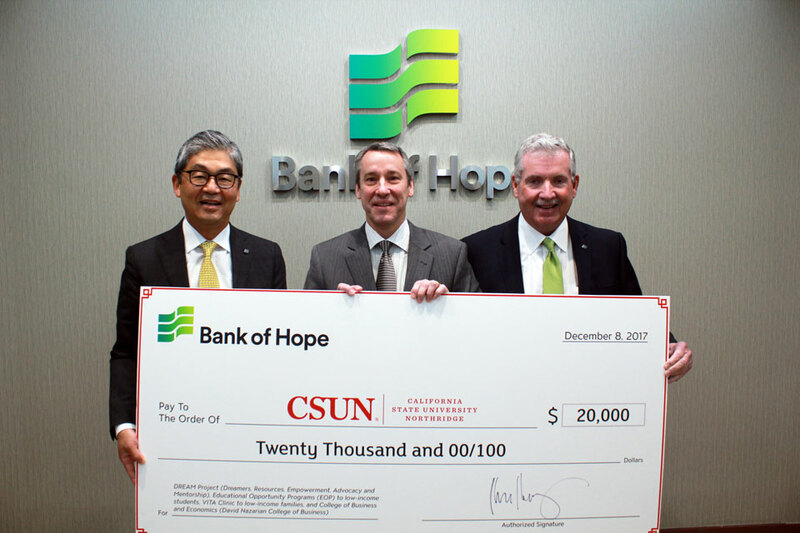 Bank of Hope has given California State University, Northridge $20,000 to help expand the university’s income tax preparation assistance program for low-income families and individuals. The money will support the operations of CSUN’s Volunteer Income Tax Assistance (VITA) Clinic during the 2018 tax season. Headquartered in Los Angeles, Bank of Hope, and its’ predecessors, have been providing financial services to the largest Korean-American community in the country for more than 36 years. Today, Bank of Hope serves a multiethnic population of customers through 64 full-service branches across nine states; eight Loan Production Offices add a presence in two additional states. The program is staffed by IRS-certified student volunteers and will be available to taxpayers six days a week at CSUN’s campus and 11 additional locations across the Valley, beginning Jan. 23 and running through April 15. During that time, ad hoc locations also will be set up to serve veterans interested in receiving free tax preparation assistance. A list of locations, dates and times can be found on the CSUN VITA website beginning in January 2018.